In print from all good newsagents or from our online store here. Or from our Apple's app for iOS devices here. You can call it a 'greatest hits' if you like. Yes, the collective brains of Computer Music magazine have constructed a special edition containing our finest articles from the past two years and it's available now in print at all good newsagents or from Apple's Newsstand for iOS devices. We debated and argued long and hard to compile our best features covering the broadest spectrum of topics. 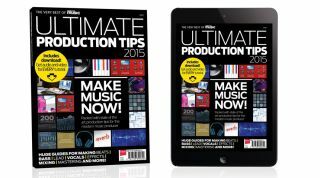 We get you grounded with 200 essential tips, take on making bass, beats, leads and more, grapple with sound design and slather the lot in lashings of lovely reverb and delay. And before we finish there's massive features on mix secrets and the very modern guide to today's mastering. It's an absolute production masterclass monster! And EVERY tutorial comes complete with audio and video to show you the techniques in practice. And in the digital edition you can just tap the links on the page. It's out now in print (at all good newsagents) and digital (inside the Computer Music app). Go check it out! It's the big one. 200 incredible tips for every hi-tech music technique there is. It all adds up to over SEVEN hours of video covering core production techniques like synthesis, drum programming, sound design, using samples, recording & editing, EQ, dynamics, melody, harmony, arrangement, width, depth, mastering… and more! We also cover techniques for specific DAWs such as Ableton Live, Logic Pro X, FL Studio, Cubase, Reason, and others. Check out this sample video from the article - there's another 199 techniques to discover in the full guide! …And much more besides, including ELEVEN tutorial videos. • What all those controls on your compressor actually do!